← From service dog to SURFace dog..
A couple of years ago Melissa invited Mitch, a ‘close’ neighbor. I put ‘close’ in quotes because Mitch lives a mile and a half up a private one-way road with ??? 15 switchbacks. The view is stunning from his house. The drive there is not for the meek…particularly when it’s snowing. The first night as Mitch talked about his military experience, I silently wondered about him fitting in with The Underground. Rick and I were on the tail-end of the Vietnam War protests, but remain influenced by our zeitgeist. Mitch is a Gulf War veteran. As time and more theme dinners passed, along with spontaneous plans (is that an oxymoron?) I realized the wisdom in Melissa’s choice. Mitch is very bright, well-traveled, well-read and loves dogs. Ah! Dogs! Along with several dogs of his own, Mitch fosters young dogs for Freedom Service Dogs. I’ve watched him work quietly with these dogs, turning them back over to FSD when the time is right. He was taught to train using only operant conditioning. Curious about the arrangement, Mitch lined up a personal tour for me a couple of Fridays ago. As we parked in the back of the facility, this soldier and his dog were outside having a smoke. Well, the dog wasn’t smoking! 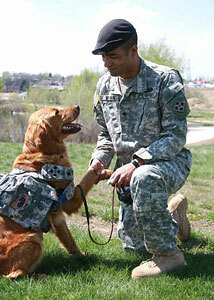 Freedom Service Dogs was founded in the 80s. While Mitch’s particular interest has to do with veterans, the dogs serve all kinds of people, including children with autism. Mitch goes down to Denver every Monday for training class. Mitch and Bella, his current FSD trainee, along with others at the same stage, go on outings…for example, to Target. All of them! I cannot wait to see this! On our way back up the hill, Mitch stopped at a small market, a favorite of his. Into the store the three of us went. Me, Mitch and Bella. Bella wore her service vest and was expected to lie down quietly every time he stopped, whether he was examining produce or talking to a clerk. An 8-month old Labrador Retriever, Bella is well on her way to mastering this much-needed skill for her future as a service dog. The hardest part for her was continuing to lie down as she was given a treat for performing this skill. I came away from that experience excited about dogs and human beings. FSD gets lots of requests for hearing dogs, but that’s not the type of dogs they train. The dogs they train need to be big enough to assist someone with physical disabilities. But! What if I started a little dog, say…a Lhasa Apso…and see where it leads. I’m betting FSD would let me tag along with Mitch and his current trainee. Who would have thought The Underground would open the door to an unexplored area of dogdom for me.